Being a “winning criminal defense attorney“, does not always mean winning at trial, keeping a client out of jail or preventing them from losing their job or children. Whatever “winning” is changes with each client and what is important in that person’s life. For a recent client, she was in poor health and had been told by a judge that she was going to do the maximum amount of jail time possible. The client hired another lawyer who, despite months of trying, was unable to convince the judge to reduce the client’s pending jail sentence by a single day. This is where LEWIS & DICKSTEIN, P.L.L.C. stepped in. 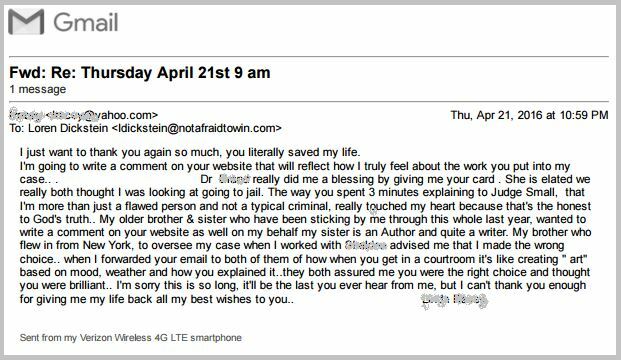 When the client released the former lawyer and hired us, we developed a new strategy and went about doing everything possible to keep this client out of jail all together. The client had serious medical needs and medical care in the jail is awful (at best). How many clubs does a professional golfer carry in his or her bag? Not just one right? A pro golfer would not be great if that person only had a driver and could hit the ball 400 yards. A great golfer has multiple clubs available for many different purposes. Similarly, a winning criminal defense attorney is not just a pit bull that is limited to aggressively fighting. A great criminal defense lawyer has the ability to not only aggressively fight but also to negotiate skillfully, effectively persuade, tactfully convince and can modify his or her approach seamlessly. The lawyer has to know what to do based upon an innate, instinctive and accurate sense of what approach is most effective in every situation. The Defense Team with LEWIS & DICKSTEIN, P.L.L.C. takes great pride in being on top of the latest law and being able to use their skills to obtain the best possible results for each client. If you are charged with or accused of a felony or misdemeanor criminal charge and you need a winning criminal defense attorney at your side, call LEWIS & DICKSTEIN, P.L.L.C. today at (248) 263-6800 or complete a Request for Assistance Form and an experienced, effective criminal defense lawyer will promptly contact you. Note: The client’s name and identifying information has been removed from the email to protect the client’s identity. The judge assigned to the case was the Hon. Kimberly Small in the 48th Judicial District Court in Bloomfield Hills, Michigan. Judge Small is an incredibly tough judge that many lawyers avoid at all costs. In our experience, although she is tough, she is thoughtful and reasonable and if given truthful, credible reasons for her to deviate from a jail sentence or an extensive jail sentence, she can be persuaded to be merciful.